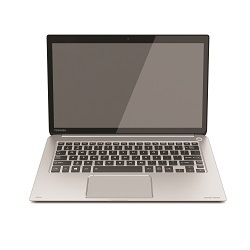 Toshiba updated their high end KIRAbook with next gen Haswell processors with added performance and battery life. KIRAbook is Toshiba’s version of Ultrabook and the new one just got a CPU upgrade and all other specs remains same. The Pressed magnesium body and PixelPure display has been retained in this model by Toshiba. The 13.3 inch display is factory color calibrated PixelPure display which has an ultra-high resolution of 2560×1440. The screen is protected with Corning Concore glass. You can choose between the non-touch and touch version of this display as well. To complement the display experience it houses Harman Kardon stereo speakers which are fine-tuned by DTS. This Ultrabook is ultra-portable with just 2.6 pounds and 0.7 inch thickness. The AZ91 magnesium alloy, honey comb base and Corning Concore glass toughens it well. The new generation of Intel core processor, along with 256 GB SSD and 8GB RAM makes the KIRAbook faster and gives a decent nine hours battery backup, also thanks to its high capacity Li polymer battery. It comes preloaded with 64 bit Windows 8.1 Pro. It packs fourth generation Intel Core i7-4510U processor for Ultrabook with Intel Turbo Boost Technology 2.0. The display is a PixelPure High performance WQHD touch display with 16:9 aspect ratio and 221 ppi pixel density, this LED backlit screen offers 176 degree wide viewing angle in both vertical and horizontal planes. There is onboard 8192 MB DDR3L Ram clocked at 1600 MHz and Intel HD graphics 4400. The Metal smart silver brushed aluminum finished body has an overall dimension of 316 x 207 x 9.5-19.8 mm. It has 3 USB ports, of which one supports sleep and charge, 1 HDMI port, and SD card reader and Wi-Fi, Bluetooth for connectivity. There is a 0.9 MP HD webcam as well and 86 key Black keyboard pretty decent offering. The KIRAbook is priced around $2100 which is expensive and we are expecting Toshiba to bring down soon. The device is available in Europe for €1649 and soon will be launched in US also.